Conan vs. Tarzan: (4 Rounds)-Who's the Pulp Hero SUPREME? Which of these barbaric bastions of pop culture would win? Don't tell me I'll have to do a New Age Outlaws (of WWE fame) and CAAAALLLLLL SOME-BO-DAAAAAAY!!! @theonewhoknows: Shouldn't Conan have the advantage in strength,durability and skills?. @agent41: Can't believe I've neglected to answer for this long!!! Real life has a way of distracting a person. Anyway, since Tarzan, among many strength feats has bent steel bars, snapped a croc's neck, tackled a charging elephant, and torn apart chains with his bare hands (causing a doctor witnessing this to exclaim "Impossible! No human strength is capable"---; among durability feats has been struck by a speeding plane yet climbed onto it and torn the door off, and took three gun shots and kept coming; and in skills kill an ape that was demolishing Batman, take out a camp of armed military men with just a bow and arrow, dodge machine gun fire, and kill a sabre tooth tiger by severing a critical nerve with his knife--I'd say Tarzan can keep up with Conan. Not saying a victory against the barbarian is ASSURRED; just saying, he definitely is not outclassed by a large amount, if at all. By the way, did you see my last respond in the PM?. @agent41: I'll check it out now. I threatened to earlier, but I guess I now will endeavor to go all WWE New Age Outlaws and CAALLLLLLLLL SOME-BO-DAAAAAAAAY!!!! @chimeroid@battle123axe@allstarsuperman@veitha@dre_savage@justthatkid@random_nerd@petey_is_spidey@ancient_0f_days@skyroid and anyone else---what do you think? Just check out this feat. and i have a shitton of others. @chimeroid:Did you read some of the feats I mentioned in post 4? EDIT: I looked it up and his feats are not that good compared to Conan. The elephant feat was done on a baby elephant. Everything else Conan replicated and oftenly one upped. @chimeroid: @skyroid:Skyroid, thanks so much for responding. Chimeroid, for the Tarzan/Sabretooth Tiger feat, google "Images of Tarzan killing Sabretooth tiger"; when multiple image scans appear, click the first one on the left and it will appear in the center of your screen. For the Tarzan/steel bars feat, google "images of Tarzan bending steel bars" and when multiple image scans appear, click either the one at the top center, or the one next to it at the top right---these are TWO DIFFERENT EXAMPLES of Tarzan bending the bars. The Tarzan-takes-care-of-ape-that-was-taking-care-of-Batman feat happened in the double sized "Batman/Tarzan Claws Of The Catwoman" one shot (haven't found a scan yet). For the Tarzan dodging machine gun fire feat, google "images of Tarzan dodging machine gun fire". When multiple images of this pops up, the whole top row contains images of this feat, so you can take your pick of which one(s) you want to click on. This is pretty much the drill you can use to pull up scans of the feats I mentioned in post 4. Incidently, I don't count the Captain America/Conan fight, because it happened in a "What If" story---and that's not really canon. Conan tears apart metal bars like they are nothing. None of these you counted doesnt come near Conan using a massive spike to kill a giant cyclops and send him flying. @chimeroid: Actually, I think the tackling a charging elephant feat I mentioned in post 4 IS comparable to the Conan/spike/Cyclops feat. But if that isn't enough, Tarzan has torn off the arms of a GIANT Venusian Crab creature; woke up in the web of a GIANT Venusian spider, and still managed to kill the alien arachnid using the power of his just free enough legs (the thrashing of the creature's efforts to escape Tarzan's assault resulted in the web being cut enough for Tarzan to get free of the web and defeat the spider properly); used jungle vines to choke out and hang a GIANT Man/ape hybrid; and flying missile kicked a Tyrannosaurus rex. Thus, I would have to disagree with you that Tarzan hasn't done anything that comes "near" the Conan feat you mention---I think he has done several things that actually SURPASS it. Uhm.. He tackled a baby elephant. A baby elephant that was aroung his height.The scan i posted shows Conan throwing a giant spike and sending a Cyclops flying. @chimeroid:(A)Baby elephants outweigh human beings by quite a lot, and there are Olympic level athletes (for that matter, street level superheroes) that can't do what Tarzan did. (B)Even if one were to lowball this feat to the lowest rung possible---attempting to diminish Tarzan in some way by focusing on this feat doesn't negate or alter all the OTHER feats I mentioned that easily match and surpass the Conan/Cyclops feat. Scuze me. But why are you such a lazy debater? You dont post feats so i cant analyze them. I debunked the one i found most impressive from reading. Dont make me google every single feat you type in here. Give me something to work with. It is hard to debate when you give nothing here. Anyhow. Even if you prove he is physically on Conans level no way would he survive the round with weapons. @chimeroid: As I mentioned in a PM I sent you (remember) I am having trouble with my PC---which is why I suggested you use the google method. I have nothing to hide; you can easily check out the feats using the methods I suggested in post 13, and I WELCOME you checking out the scans you will see. If you don't wish to do that, however, there is nothing I can do to compel you to engage in activity you don't want to engage in. As far as "debunking" the elephant charge feat, I don't see why a human being capable of tackling an out of control animal weighing a few tons is somehow not impressive (when, as I mentioned, there are Olympic level athletes and even street level superheroes that couldn't do the same to this "baby") but everyone has their opinions. I respect your right not to share mine regarding this matter. Finally, while I readily accept that it is POSSIBLE Conan beats Tarzan in the weapons rounds---your saying there is "no way" Tarzan can survive is, I feel, a bit strong. A man that was able to face the pincer "weapons" of a giant, animal fast Venusian Crab creature, the razor sharp, fanged teeth and slicing claws of an animal swift Sabretooth tiger, and in several different instances, men armed with guns (including a camp of soldiers with MACHINE guns, while having only bow and arrows) is probably fast, strong, and skilled enough to---as formidable as he is---defeat Conan. @chimeroid: As I mentioned in a PM I sent you (remember) I am having trouble with my PC---which is why I suggested you use the google method. I have nothing to hide; you can easily check out the feats using the methods I suggested in post 13, and I WELCOME you checking out the scans you will see. If you don't wish to do that, however, there is nothing I can do to compel you engage in activity you don't want to engage in. As far as "debunking" the elephant charge feat, I don't see why a human being capable of tackling an out of control animal weighing a few tons is somehow not impressive (when, as I mentioned, there are Olympic level athletes and even street level superheroes that couldn't do the same) but everyone has their opinions. I respect your right not to share mine regarding this manner. Ok, then i shall go around finding feats and one upping them with Conans feats of similar type. I did Debunk the elephant pheat. Baby elephant that was under 6ft tall is not that impressive. No more than tackling a full grown horse. Yes, for normal humans it is impossible but for Conan it is nothing special and i one upped that one by far. That cyclopse weighed a lot more than the elephant Tarzan tackled from the side. For the venusian Crab creature. Ok awesome feat. So lets see how conan does against supernatural foes. As far as sabretooth feat yeah, it is awesome, but conan killed Cheetas, Tigers and Grizzlies with relative ease. I'd back Conan, they are somewhat comparable in physicals but Conan is stronger in my opinion and is the better warrior overall, not really going to comment on round four it seems stacked against Conan since he has no back up. @chimeroid: As I mentioned, trying to diminish Tarzan by focusing on the elephant (as if that were Tarzan's only feat I mentioned that matches and surpasses the Conan/Cyclops feat) is an ill advised strategy. Claiming tackling a charging baby elephant is like tackling a horse(?!) when it FAR outweighs any mare is going farther down the rabbit hole. And Conan killing Cheetah, Tigers and Grizzlies with ease---those don't compare to Sabretooth tigers, giant Crab Creatures, and giant spiders. Besides, the lions, crocs, and apes that Tarzan has killed "with ease" would nullify that anyway. The bottom line is, nothing you have mentioned give Conan some kind of HUGE, if ANY advantage over Tarzan---and the fact that Tarzan has dodged MACHINE GUN fire more than once gives him an edge-speed-that provides the difference in who would win between two such evenly matched combatants. @theonewhoknows: You want Giant Creatures why didn't you just say so? plenty more where that came from, by the way if you have Tarzan killing a sabretooth tiger as impressive? you should see the primeval rhino that Conan was wrestling in one scan, it dwarfs that Elephant easily. You also mentioned Speed and Conan has plenty of that as well. I am not diminishing Tarzan at all. I gave an answer for EVERY FEAT YOU POSTED AND I ONE UPPED IT WITH CONANS FEATS. Do you just ignore my feats? Ok. I get it Tarzan dodged gunfire. Conan couldnt do that because he lives in time before there were firearms. Also i didnt go all out with feats like @devil_driver Because i was trying to only emulate your feats only on a higher level. Now. For your Crab post i posted 3 pics that are FAAAR better than that feat. Just take a look at those pics. @devil_driver: @chimeroid: Excuse me---"trolling" you? I don't troll---EVER. ESPECIALLY to people who have proven to be logical posters over time. Actually, I'm beginning to think I'M the one that is being trolled, because you seem to be deliberately allowing the points I make to sail over your head. But because you are normally a dependable, sensible poster, I'm going to hold back a bit and just assume there is a communication problem that, with time, can be solved, so let's try this again. In my experience, when a person fixtates on ONE thing they think is is a "weak link" apart from SEVERAL examples I use to display a character's prowess, it has almost always been because the larger point-that the character is equal, or even has an advantage of some sort-they can't dispute, so they focus on that one example they think is a "weak link" to diminish the character I'm advocating for. An example is a thread featuring Superman vs. Silver Surfer, where, to prove that Surfer's TP is not a "cinch win" for Radd, I listed a LONG line of people Supes has resisted with that power (including Martian Manhunter). But instead of acknowledging the point-that Superman's history of resisting SEVERAL powerful TP's means that Surfer's TP is no "cinch win"-the person ignored all the TP's I mentioned to focus on the one (Eradicator) that he apparently thought was a weak link to imply that Surfer's TP was a sure thing against Supes. (In contrast, another poster-even though they thought Surfer could beat Kal-immediately accepted that-due to all the examples I used-Surfer using TP was NOT a sure thing, and went on to argue other methods Surfer could use to get a victory). Get it now? By continuing to talk about the charging elephant feat, while SEEMING to ignore all the other feats I mentioned, you seemed to be doing the same type of thing. If that was NOT what you were doing, then fine; we can move on and not speak of it again, since my point was to name SEVERAL feats to match and surpass the Conan/Cyclops feat to show Tarzan is in Conan's class---not to get bogged down going back and forth about a SINGLE feat. In that same vein, it is useless to keep mentioning animals the two characters have defeated---because it skips over the main point, that Tarzan has killed enough to prove he is on par with Conan in this area. I mean, c'mon---are you REALLY trying to claim that Conan killing Cheetahs, Tigers, and Grizzlies "with ease" is some kind of game changing advantage over Tarzan's killing Crocodiles, Lions, and Apes "with ease"??? Are you REALLY trying to claim that killing a Grizzly is a HUGE improvement over killing a Sabretooth Tiger??? A quick re reading of some of your responses and acknowledgement of Tarzan's feats proves once again that you are one of the more reasonable and responsible posters on this board---so stop ignoring the main point, that Tarzan matches Conan in this area (otherwise we can go 'round and 'round naming animal killing feats that don't change the MAIN point, that Conan has no discernible advantage in this area over Tarzan). And that goes for all the other things, like strength (they both have bent steel bars, Tarzan has snapped chains, Conan picked up that large spike, Tarzan has lifted a huge, heavy tree stump, etc.). Conan's feats I see are impressive---but nothing SOOOOO much greater than the Tarzan feats I mentioned in post 4-being struck by a speeding plane, but still leaping on it and tearing the door off to get to his foes; or virtually no-selling three consecutive gun shots; or snapping a saber with his hand after getting shot, or any number of things I can mention. In strength, skills, durability and the like, I just haven't seen something presented that would indicate SUCH a big advantage over Tarzan that Conan can just run all over the man---which is what seems to be the suggestion being made here (remember stating there is "no way" Tarzan can win the weapons round, Chimeroid? Again, that would seem to be a strong statement since Tarzan has defeated people with GUNS---even MACHINE GUNS). Even if you think Conan could win---it simply defies logic to claim, with their similar feats layed out-that Conan can just DEMOLISH Tarzan. The jungle dweller's speed, to me, is the advantage that shows that the most likely winner in this fight would be Tarzan. @devil_driver: @chimeroid: Excuse me---"trolling" you? I don't troll---EVER. ESPECIALLY to people who have proven to be logical posters over time. Actually, I'm beginning to think I'M the one that is being trolled, because you seem to deliberately allowing the points I make to sail over your head. But because you are normally a dependable, sensible poster, I'm going to hold back a bit and just assume there is a communication problem that, with time, can be solved, so let's try this again. Tarzan has the speed advantage, but he is a savage fighter while Conan is trained in many a martial arts. That is why i believe he takes this. They are both Stronger and faster than Captain basically. I still believe that Conan is at least 30% stronger and i have feats in reserve to prove it. In weapons round i would back a person with a sword over a person with a knife most of the time. Even if we were to concede they have same stats and Tarzan is like 20% faster i still dont see him overcoming Conans skill with sword. @chimeroid: I wouldn't necessarily say Tarzan even has a noteable speed edge, Conan can outrun a greyhound which runs about 40 mph, and the reason I posted the scan of him dodging the bullet was to show he is in that category, and was clearly unfamiliar with his surroundings. On the other hand while Tarzan has bested some animals the scope and size of the animals that Conan has bested dwarf the Tarzan examples, compare the Tarzan elephant with this giant rhino. In any event even if we want to say that their stats are near equal, Conan has the clear advantage in terms of martial prowess armed and unarmed, he has beaten the best swordsmen of his universe and the best hand to hand fighters, including skilled Khitan Martial artists who know pressure points for example, Tarzan doesn't fight dark gods and inhumanly powerful demons either. He is definitely more agile and could have the speed advantage. I just dont know what the last round is and would like more info on his animal call. @devil_driver: @chimeroid:Chimeroid, I appreciate that you are able to AT LEAST concede BASIC things in a debate---but Driver, apparently, not so much. So Driver, you are STILL playing contrast and compare with the elephant, when that topic has been dropped because it is SO BESIDES THE POINT in what was being pointed out? You make the baseless claims that the animals Conan has faced in general are bigger in "size and scope" than Tarzan's based on one example of that Rhino vs. the elephant? So you are playing the game that I layed out for Chimeroid NOT to play---focusing on ONE example you think is a weak link to diminish Tarzan (while ignoring all the OTHER examples I used in post 15-the HUGE TYRANNOSAURUS REX, the GIANT VENUSIAN CRAB CREATURE, and the GIANT VENUSIAN SPIDER? C'mon, Driver---SURELY you are not one of THOSE posters---the ones who WILLFULLY IGNORE information to get the results they want, ARE you? Let's try letting facts and feats lead us to wherever the truth lies, and not just going by either who one "likes" better, or adopting the "Once I make a choice, I'm sticking by it no matter what information I get" strategy you appear to be employing. I can't read your mind, so I may be wrong---let's hope so. 'Driver, I shouldn't have to use a thousand examples of something to prove that two characters are on par with each other. For instance, if Conan is shown bending bars 20 times, and Tarzan is shown doing it 3 times, that doesn't "prove" than Conan's efforts are more "special" because he is shown doing it technically more times! If both are shown doing something more than once, with ease, then the MAIN point is proven---that they both are strong enough to bend metal. So likewise, you should really quit with the animal thing; BUT. JUST FOR YOU---a couple more examples: google up "images of Tarzan breaking sea creature's jaw", and when multiple images pop up, click the third image on the top row. Up on the center of your screen will emerge the scan of Tarzan, in the ocean, after a day of strenuous trauma, nonetheless snapping the jaw of a GIANT SEA CREATURE that had the jungle dweller in it's mouth (and as you can see, the monster "DWARFS" that Rhino). And just for extra fun and giggles, why don't you google up "images of Tarzan snapping lizard-bird's jaw", and when multiple images pop up, click the second image on the top row. On the center of your screen will emerge the scan of Tarzan savagely snapping the GIANT creature feature's jaw with FRIGHTENING ease. 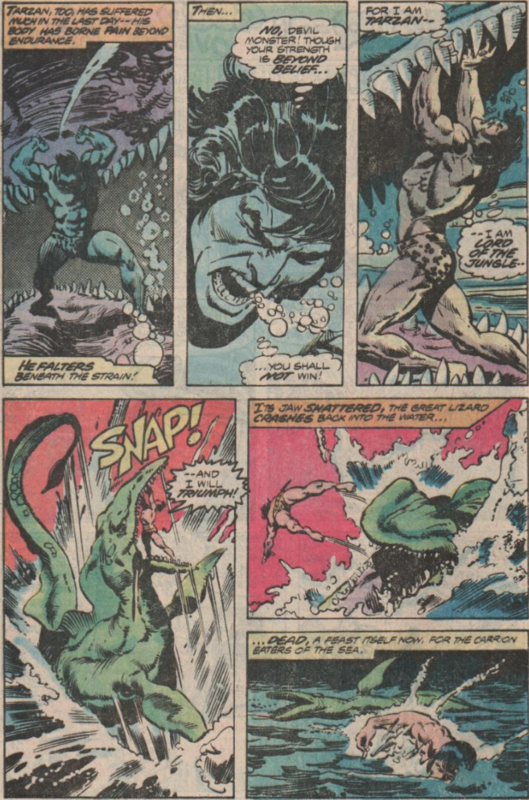 So ENOUGH with trying to give Conan some kind of edge in the "Killing Creatures" area, because as the MULTIPLE examples I've layed out of Tarzan slaying both "normal" and "extra normal" animals display---Conan SIMPLY DOESN'T HAVE IT. Oh, and Tarzan has faced Magical forces and demons as well---a quick example is the 8th century sorcerer Abdul-Al-Hazared (who faced the likes of Wolverine) in Tarzan Lord Of The Jungle issue 23. Not only is he a powerful sorcerer, but he unleashes deadly, lethal demon hordes on his opponents (there's more, but he should do for now). So after receiving this information, if you don't AT LEAST concede that Conan does not have some kind of HUGE advantage in the aforementioned areas, you will be guilty of ignoring information to get the results you want, instead of a person who-even if they have a preference-seeks out the truth, no matter what it might be. Which leads me back to you, Chimeroid. Like I said, I'm glad you concede some things (including the agility and speed advantages, which to me is irrefutable). In that spirit, I will concede that in the weapons rounds, you have a point concerning a sword vs a knife (ESPECIALLY when that sword is wielded by such a master combatant). Conan would seem to be the favorite in such match-ups; I just think that due to Tarzan's speed and agility it is not a SURE THING that the barbarian would win---but he DEFINTELY has an advantage, no doubt. But in a cage match round, Conan's fighting skill is not going to help him much, in my opinion. Conan is no slouch in the "savage fight mode" of course---it would be close, and the victor will walk (or should I say, be CARRIED out) in pretty bad shape! So my premise stands---by stats, facts, and feats-it DEFIES LOGIC to claim Conan can run all over Tarzan. P.S.-Can't resist---google up "images of Tarzan knocking down an elephant with a log" , and when multiple images appear, click on the third image on the second row. Click it, and on the center of your screen will emerge the scan of Tarzan knocking down a FULL GROWN, HUUUGE elephant that "DWARFS" the Rhino. @theonewhoknows: Did you miss the part where I said even if we assume their stats are equal I still think Conan is the better warrior? because at this point that's what it's going to come down to, I never said Conan would stomp Tarzan or that it wouldn't be a good fight I just feel Conan will win. @devil_driver: You don't have to blatantly type out the words "Conan would crush Tarzan" to imply it. Maybe you actually don't realize the impression you left in your posts, but re read them again closely; tacking on a "even if we assume their stats are equal" bit at the last second does little to mitigate all you wrote before. Any skill advantage that Conan might have won't matter that much if Tarzan has a speed advantage, plus great durability (no selling three straight guns shots, being hit by a speeding plane yet jumping on it and ripping the doors off to get to his foes, etc.) to compensate for it. And saying you "feel" that Conan would win (because you "think Conan is the better warrior") with no real advantage proven, while making false statements about what Tarzan can and cannot do is the TEXTBOOK definition of picking someone 'cause you "like" them better, not because some huge, gaping superiority of Conan has been shown. You have every right to "like" who you want. Proving who would WIN, however, is another matter. But I DO appreciate the belated statement that you're not claiming "it wouldn't be a good fight". @theonewhoknows: Woah Captain Projection take it down a notch, first of all I didn't imply that Conan would stomp Tarzan, I obviously do think he would win though. And secondly Tarzan doesn't have much of a speed advantage if he has any at all, this is where your own logic of Conan not being much stronger than Tarzan goes against you. Now Tarzan has been exposed to gunfire more than Conan obviously, but as I posted Conan dodged a bullet himself while being unfamiliar with what a gun was, it can also be argued that the knife he dodged point blank that penetrated two men and kept flying is equal to bullet speed itself, and if you want to talk about pain tolerance I can post plenty of scans for Conan in that regard as well. I don't claim to know much about Tarzan and you have done a piss poor job of even making a case for him or displaying his abilities yourself, the little you have shown or alluded to hasn't impressed me greatly for the sake of argument, and this whole "you feel doesn't mean he wins blah blah blah" as if you are talking to someone who cannot debate properly, get over yourself man seriously. I'm still waiting for you to prove that Tarzan has a speed edge that is good enough to influence the outcome, and then tell me why you think Tarzan would win even if their stats are dead even, I've made my case that Conan is a better warrior than Tarzan, because he has beaten more than fodder warriors in armed and unarmed combat and showcased mastery with every weapon that exists in his time period. @devil_driver: You got into an A and B conversation between me and Chimeroid to claim that Conan is stronger. I displayed feats that matched the ones Chimeroid stated that he felt gave Conan an edge in this category (bending bars like Conan has, lifting huge objects like Conan has, etc.). He mentioned a giant Cyclops, I mentioned MULTIPLE giant things Tarzan has defeated. You mentioned "you want giant creatures?" and gave some of your own. I countered that with more that Tarzan did. Despite this, you STILL claimed that Tarzan hadn't faced creatures "the size and scope" that Conan has, using the Rhino as an example. I completely DESTROYED that notion with the examples I mentioned in post 29. You stated Tarzan hasn't faced demons, and I revealed he has in post 29 as well. In short, everything that you have claimed is an advantage for Conan, or that Tarzan "hasn't faced" I have provided-sometimes, with MULTIPLE examples-that you are flat out wrong. Yet you come back and claim that I have made a "piss poor job of making a case for him or showing his abilities" (I have even directed you to how to view scans of the things I mentioned). Also-even though YOU brought up the whole "Conan's animals are bigger than Tarzan's animals" crap as an important attribute to display Conan's superiority over Tarzan-now that I exposed that as COMPLETELY FALSE, now all of a sudden this attribute is lowballed to Tarzan has UNIMPRESSIVELY "killed large animals". Huh. As I said before---you appear to be a TEXTBOOK example of ignoring information to get the result you want because either you "like" a character better, or once you pick a side you dig in your heels and won't change no matter what information you receive. As further evidence of this tendency, you try to get around Tarzan dodging not just gunfire, but MACHINE GUN fire-on MORE THAN ONE OCCASION-as evidence that Tarzan has a speed advantage. You try that in many non sensible ways, but the MOST amusing? You actually try to claim that a KNIFE-no matter HOW swiftly launched-is EQUAL TO TARZAN dodging MACHINE GUN FIRE!!!!! Wha? WHAA---?!? HUH??????????? WHO-WHAT-WHEN-WHY------?!!!!!!!!!!!!!!!!!!!!!!!!!!!!!!!!!!!!????????????????????? HOW??!! Okay, I've gotten control back now. Saying something like THAT, you have the nerve to say I'M the one that has done a "piss poor" job? I think you are having pronoun trouble when you try to diagnose ME as "Captain Projection". I think you were looking in a mirror at the time, didn't like it and got confused. So actually, YOU need to get over YOUR self. The decision on who wins a battle-at least for me-does NOT come down to who I "like" better (as an example, the Nightwing character is one of my all time faves---but when the proper evidence was presented to me, in a "Nightwing vs. Winter Soldier: 4 rounds" thread I went from claiming he would get a 4 round SWEEP to admitting it would more likely be a 2 to 2 draw). That's how I'M committed to roll in threads---stats, facts, feats and logic, period. So actually, no---it does NOT have to come down to who one "likes" better, if one is serious about arriving to the TRUTH, and not just cheerleading for their fave. So you need to follow your own advice, and "take it down a notch". If you in fact ARE one that "knows how to debate properly" then prove it. You started to by appearing to-grudgingly-state that their strength and durability is equalized (and I think the examples I mentioned more than show this); I think Tarzan's speed in two combatants this near equal would prove the difference. @theonewhoknows: You said that I cannot comprehend reading and you made a post that stupid...wow I'm only going to address one thing because honestly I'm not even going to bother continuing a conversation with you at this point, nowhere and I mean NOWHERE IN MY POST did I say the knife was equivalent to machine gun fire, I said it could be argued that the knife was equivalent to bullet speed, and I say that because you will never see a knife fly through a human body let alone two when it is thrown by another human, I haven't done the math on the feat that's why I said "could be argued" I also showed Conan dodging lightning that alone should be enough for a "sensible debater" to infer that they are in a similar tier where speed is concerned. If you and Chimeroid want to continue this have fun. @devil_driver: In other words, o' defeated one---you got nothing. I know it. YOU know it. And your attempt to save face doesn't work. I didn't say you said "the knife was equivalent to machine gun fire". I clowned you for implying that a "knife NO MATTER HOW SWIFTLY LAUNCHED (LAUNCHED being the key word) was equivalent to Tarzan dodging machine gun fire". Anyone can read the post and see what I typed---so your attempts to explain things away are both hilarious AND sad at the same time. You reconfirm this in your last post by stating, quote, "I said it could be argued that the knife WAS THE EQUIVALENT TO BULLET SPEED (?!?) and I say that because you will never see a knife fly through a human body let alone two when it is THROWN BY ANOTHER HUMAN"! So you think a HUMAN can THROW A KNIFE as fast as a MACHINE GUN can propel MULTIPLE BULLETS??? It would take someone with-maybe-the strength of Wonder Woman to throw a knife that fast---and even then, throwing a SINGLE knife would not be the same as Tarzan dodging multiple bullets from a MACHINE GUN. To make a claim like that, you INDEED "haven't done the math"! And you have the gall to talk about reading comprehension and posting something "STUPID"??? After stepping into it even deeper, I think it IS a good idea for you move on along. I didn't say you said "the knife was equivalent to machine gun fire". I clowned you for implying that a "knife NO MATTER HOW SWIFTLY LAUNCHED (LAUNCHED being the key word) was equivalent to Tarzan dodging machine gun fire". Anyone can read the post and see what I typed---so your attempts to explain things away are both hilarious AND sad at the same time. You reconfirm this in your last post by stating, quote, "I said it could be argued that the knife WAS THE EQIVALENT TO BULLET SPEED (?!?) and I say that because you will never see a knife fly through a human body let alone two when it is THROWN BY ANOTHER HUMAN"! So you think a HUMAN can THROW A KNIFE as fast as a MACHINE GUN can propel MULTIPLE BULLETS??? It would take someone with-maybe-the strength of Wonder Woman to throw a knife that fast---and even then, throwing a SINGLE knife would not be the same as Tarzan dodging multiple bullets from a MACHINE GUN. To make a claim like that, you INDEED "haven't done the math"! "You actually try to claim that a KNIFE-no matter HOW swiftly launched-is EQUAL TO TARZAN dodging MACHINE GUN FIRE!!!!!" This is exactly what you said, I don't know what you are smoking but I never claimed this I didn't try to claim that a knife was equal to Tarzan dodging machine gun fire, as you said anyone who comes along can read what you typed, the only thing you have clowned is yourself, but instead of just dropping it and moving on, I knew you couldn't resist the obligatory cheap shot on the way out and all of your hee hawing just makes you look stupid. I also don't know where you got me saying a human could throw a knife faster than a machine gun or even as fast? my point which was quite easy to understand, was that throwing knives don't go through human bodies under normal circumstances let alone two of them, hell crossbow bolts don't do that and in some cases even bullets don't, I said I didn't bother to do the math because I didn't plan on discussing it further. And as far as the gall? it doesn't take much gall to point out the obvious, if I stepped in it on the way out, you just went neck deep in it. @devil_driver: This is the second time you've GIVEN advice that you should have TAKEN-which in this case is that you should be "dropping it and moving on". Anyone can INDEED see what I AND YOU have typed, and your futile attempts to talk around your babblings are ever more hilarious. What is "easy to understand" is that as long as you deny and reply to me, you will henceforth be availing me of ever more side splitting amusement. You tried to claim that a knife thrown by a human can be equal to machine gun fire being dodged. You can try to talk around it for the next 1,000 pages and it will STILL be true that THAT is what you posted. When you strip away all the superfluous words you are saying the equivalent of "Uh-uh!" Nany-nany boo boo, I did not"! But please, DO reply and deny the undeniable. FREE entertainment so excellent is RARE these days. @theonewhoknows: No that's just how your crazy brain chose to interpret it, you can go from "That knife could be argued to be equal to bullet speed" to "You said that's equal to machine gun fire" all you like but it won't make sense to anyone who can read, I'll help you out with it actually because I'm a nice guy most of the time. If I had said "Conan dodging this knife means he can dodge machine gun fire" then you would be right, I'm willing to drop the issue and move on the reason I was attempting to leave the thread was to prevent further derailing not to "save face" as you put it, you can laugh all day if it makes you feel better, but it doesn't make you right, so whatever the misunderstanding and for my part in this disagreement I'll just apologize and leave it be from this point I've said what I need to say if you want to keep taking shots that's fine by me, but this will be my last response to you. @devil_driver: I see that you tagged me, Wrongy McWrongerson, but whatever you wrote I didn't read, because your trying to claim you didn't say what you said about a knife thrown by a human being comparable to Tarzan dodging machine gun fire, when everyone who reads your words can see that you did, renders your opinions moot. Comic fans. You GOTTA love 'em. Hmmmm---perhaps more comments can be gleamed. @battle123axe@termiteone4ever@god_of_wrath@speedster101@rick_grayson@christianrapper@reno117@pokeysteve@misterwhisper @myerlanski and anyone else who wishes to weigh in---what do you think? tarzan's stats are much higher than an average human, but he has no formal training. I will go with coan. he has tons of formal training. Conan's training is on warrior status that Tarzan hasn't never faced, so Conan can take this simply because his abilities are on another level that Tarzan can't keep up. @theonewhoknows: ah, sorry, dont know enough about those characters. @reno117: @christianrapper:I hate to differ with you guys a bit (and I acknowledge that Conan has the ability to beat Tarzan up front, keep that in mind). But Tarzan has beaten not only PEOPLE with "formal training",but one of the most formidable CREATURES with formal training in pop culture: PREDATORS. ---then I think it's safe to say that Conan's "formal training" can be compensated for. @battle123axe it's cool---maybe you'll be able to comment with enough knowledge on my next thread. conan lives in a fantasy world. he fights monsters and stuff all the time. he is a vastly skilled warrior compared to tarzan. he fights and kills multiple warriors all the time. even though tarzan might have a slight stat advantage, conan is used to fighting people like him. he also has better weapons. the only round i see tarzan winning is possibly round one. in the last round conan isn't going to sit there and let him make a animal calling cry. if tarzan attempts to do that, conan will slice his throat. For what it's worth, InQuest magazine picked Conan. For what it's worth. I personally think that Tarzan is way too much for Conan to overcome. Agility and survival skills are peaked in this dude. And he's got what it takes to fight his way through strength contest too. Add all this together you got a hell of a warrior. @god_of_wrath HEY, man---long time no hear from! In fact, it's just by accident that I'm noticing you responded to this thread---you accidentally typed "the8onewhoknows" instead of "TheOneWhoKnows"! At any rate, once again it is good to hear from you, and thanks for expressing your opinion. I think some MORE opinions can be mined here. So @breakingthrones@misterwhisper@dextersinister@rick_grayson@dontevenblink@jmarshmallow@xxxcarzellxxx@sirfizzwhizz@grandwonder and anyone else---what do you think?